London and Brussels will start rolling Brexit negotiations in the final phase of talks as fears grow that Britain could leave the European Union next year without a deal, EU negotiator Michel Barnier said Tuesday. 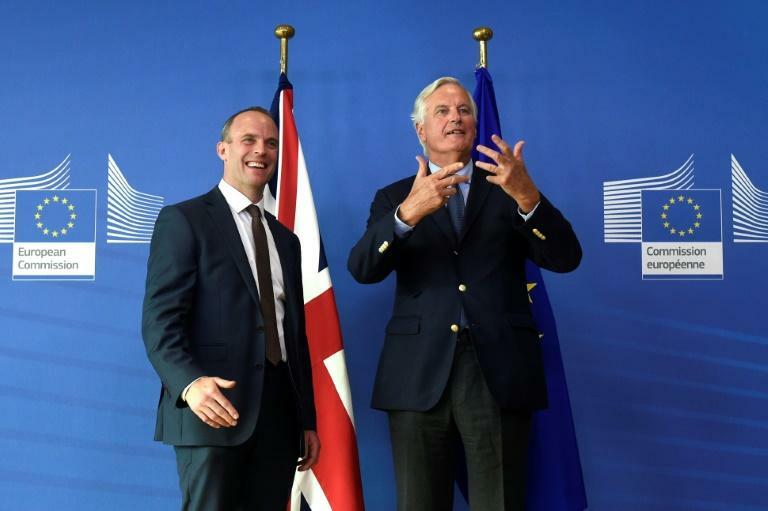 Barnier and his British counterpart Dominic Raab said after talks in Brussels that key differences remained and it was important to "intensify" the pace of negotiations. "The negotiations are now entering the final stage. We have agreed that the EU and the UK will negotiate continuously from now on," Barnier said after meeting the UK's Brexit minister Dominic Raab in Brussels. "Dominic and I will meet regularly to take stock and move the negotiations forward." The Brexit talks have become stuck on fundamental issues including how to avoid a hard border between EU member Ireland and the British province of Northern Ireland after Britain leaves the EU's single market, and on the future trading relationship. The two sides have just a few months before an agreement on Britain's divorce from the European Union -- set for March 29, 2019 -- must be forged in principle by October or November. Raab -- whose predecessor David Davis resigned in July over differences with Prime Minister Theresa May's negotiating strategy -- said that he would be back in Brussels next week for further talks. "We have agreed that we need to step up the intensity of the negotiations," he added. "If we have that ambition, that pragmatism, that energy on both sides, I'm confident we can reach a deal in October," he said. Until now there have been separate "rounds" of Brexit talks every few weeks, but the pace has increased noticeably since Raab took over from Davis, who made just a handful of visits this year. Leaving without a deal could hamper exports to the EU, Britain's largest market, as it would end tariff-free trade. Raab played down talk of a "no deal" scenario, saying only that Britain had to be ready for "all eventualities". "Our actions speak louder than words. We're out here, I'm here seeing Michel again, I should be returning next week. We're going to be picking up the intensity of the negotiations -- we agree on that -- at a political level," he said. Barnier said the main challenge in the coming months was to set the shape of the future trading relationship between Britain and the EU, saying it was a "partnership that has no precedent." May's strategy calls for largely frictionless trade with the EU, but Brussels has warned that Britain cannot expect all the benefits of the single market without also respecting rules on free immigration within the 28-nation bloc. British Foreign Secretary Jeremy Hunt was set on Tuesday to once again warn that a Brexit with no deal could threaten the continent's unity for a generation, according to his office. "One of the biggest threats to European unity would be a chaotic no-deal Brexit," Hunt was to say in a speech at the US Institute of Peace in Washington, according to excerpts provided by the Foreign Office. Meanwhile, British Trade Secretary Liam Fox urged Britain to look beyond Brexit as he unveiled the government's future strategy to become an "exporting superpower". A key problem for Britain is its aim to stay part of the EU's customs regime while also being able to strike its own trade deals with other countries. "It's really important that we don't have such a narrow bandwidth that we only think about Brexit," Fox told a business audience in London.